As a result of age and other factors, some men and women develop a wrinkle of sagging skin in the submental area, casually referred to as a “double chin”. There are many surgical options for the double chin but some find them to be too time consuming and expensive. Torrey Pines Dermatology recognizes this and is proud to offer a non-surgical, minimally invasive answer to this cosmetic concern with Kybella®, an injectable treatment intentioned to remove the fat that causes the “double chin” while also restoring tautness to the area in the process. If this description has appealed to you as a patient, please don’t hesitate to contact us at our office in San Diego and discover what Kybella® can do for you. 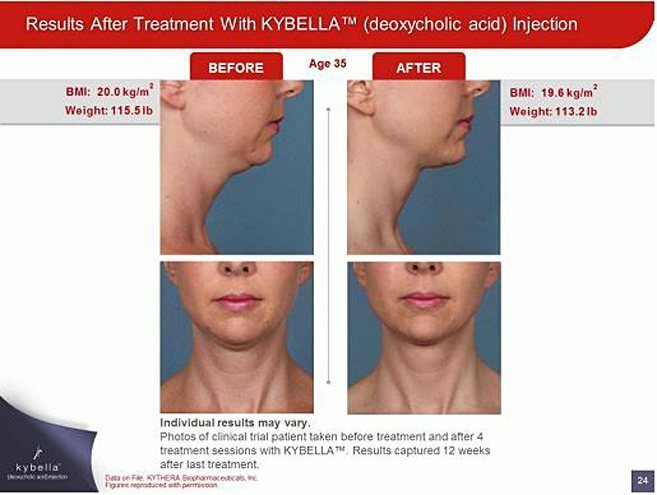 Composed of Deoxycholic Acid, a chemical naturally used by the body for the absorption of fat, Kybella® is administered through a series of injections into the submental area, with the aim of removing the excess amount of fat cells that cause the double chin. Each individual injection has a typical duration of 15 to 20 minutes. The amount of sessions is dependent on the needs of the specific patient, but it is recommended that they are spaced out at least 8 weeks apart from one another and that a single patient receives no more than six treatments in total. After an injection of Kybella®, patients typically will be able to return home but should keep in mind that tenderness and swelling of the area can occur and that they should avoid exposure to sun to help keep the side effects to a minimum. Kybella® is one of the first treatments of its kind, meant to break down and remove fat cells without any incision into the skin, because of this, the treatment can be a superb option for those who do not qualify for surgery or don’t want it. Avoiding surgery also means that the procedure decreases the amount of downtime needed to recover, which can make it ideal for busy professionals who cannot afford to spend time on bedrest. The comfortability of the treatment does not come at the cost of its efficiency, and the effects of the Kybella® formula and procedure have been clinically shown to have the ability to be visible on the face for years following the treatment. Kybella® is FDA-approved for the treatment of fat below the chin. Individual questions pertaining to safety of the treatment will be answered during a consultation appointment required before the procedure itself is scheduled. One of our practitioners will discuss your specific goals for the treatment and your prior medical history to find out if Kybella® is right for you. If it turns out that it isn’t, we will discuss available alternatives that could help to meet your needs. A consultation appointment is needed to make sure of candidacy but most healthy men and women in need of the procedure will be applicable. Kybella® is not meant to be used on minors. If you have any other questions regarding Kybella® as a treatment, contact us and we’ll be happy to provide you with whatever answers that we can.